Dragon Con Zombie Walk - Zombiewalk.com - Your source for all Zombie Walk and Zombie Flash Mob planning! 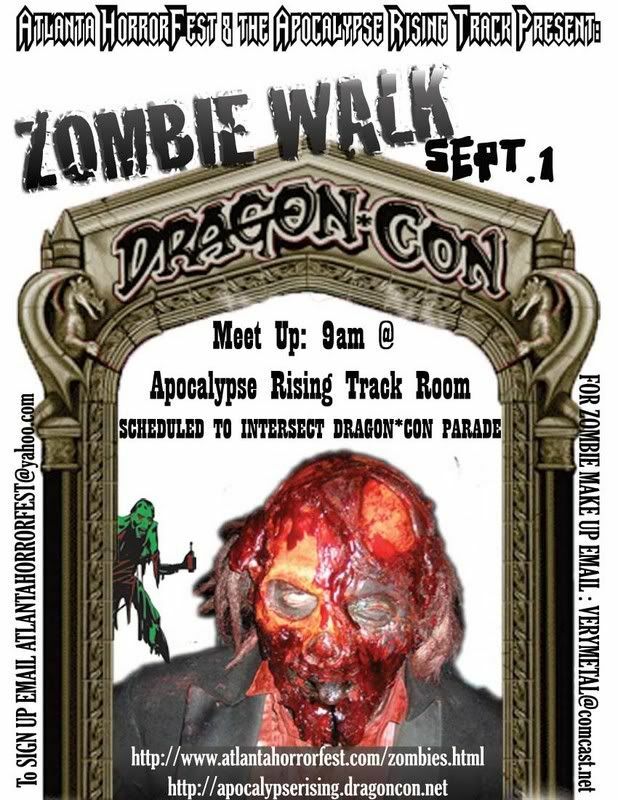 We will be doing a Zombie Walk at Dragon Con this year along with working on the Apocalypse Rising track that has been scheduled. More info to come..
Also if you havent been to www.atlantahorrorfest.com yet we have announced our date for the official Zombie Walk Atlanta. Saturday, October 6th, 2007. GEt ready for the zombie season!!!! Just got word from our people at the Apocalypse rising track for Dragon Con. We are going through with the Walk. It will be the morning of the Dragon Con parade through downtown Atlanta. Meet up will be at 9:30 am Saturday September 1st in the Apocalypse rising Track room. If you need make-up done, project zombie attack will be on hand to assist in all your zombie needs, we will be there, starting around 7am. the earlier you get there, the better your chances are of getting makeup done, we must be out fo the room by 9:30.